A great movie with an equally great title. Ash and I watched it last night after avoiding it for quite some time. Like "Hotel Rwanda" and "Crash" for others, this was just one of those movies you order from Netflix that you know is going to be good, but that is just too heavy to pop in the old DVD player after a long day at work. 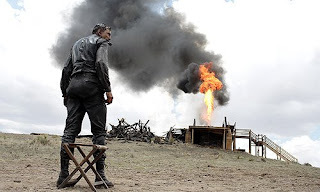 Director Paul Thomas Anderson will pretty much get a lifetime coolness pass from me for making "Boogie Nights", but "There Will Be Blood" solidifies my theory about PTA's work. He either makes easy-to-follow fare like "Boogie Nights" and "Hard Eight" or head-scratching works of high-minded storytelling like "Magnolia." "There Will Be Blood" falls squarely in the second category. As it was released at nearly the same time with a very similar tone and style, I expected to compare "There Will Be Blood" with the Coen Brothers' masterpiece "No Country For Old Men." Luckily, they stand on their own as separate visions.